Providence, Rhode Island—The Brown Bears advance to the second round after defeating the Johns Hopkins Blue Jays, 17-8. The third quarter was the difference in the game, as the Bears scored eight goals in the quarter. The combination of timely saves, pressure defense, and faceoff dominance keyed the Bears to victory. Brown opened up the scoring in the contest after both teams traded possessions, having opportunities each way. Attackman Henry Blynn would score, with an assist credited to Matt Graham. Eleven minutes had passed before the ice was broken. Immediately following a TV-timeout, Brown would take a two-goal lead when Dylan Molloy would find long-pole midfielder Jack Miller open in front of Blue Jay goalie, Brock Turnbaugh. It would be Miller’s second goal on the year. The quarter would end with Brown Bears leading by two, holding the Blue Jays scoreless. Dylan Molloy would duck beneath a Hopkins double team to open the second quarter. Following a transition save by Turnbaugh, Hopkins would score to answer. Senior Holden Cattoni would beat Brown’s Jack Kelly low as he turned raced down the left side of the defense. The quick scoring would continue, as Brown would capitalize on their following possession. Bailey Stills would score his 16th of the season, regaining the three-goal lead for the home team. Brown’s continued wins on faceoffs placed a lot of pressure on Hopkins to either make saves, or get turnovers. Hopkins would have chances following the first penalty of the game. Twice Brown goalie Jack Kelly would make stops, keeping the lead to three. Following the extra-man opportunity, Brown would capitalize to increase the lead to four. Brendan Caputo would score with 6:42 left in the half. Off of a timeout, Hopkins was able to cut into the Brown lead. Midfielder Cody Radziewicz was able to score. Brown answered with 1:35 remaining, as Henry Blynn would score his second of the contest, assisted by Molloy. Hopkins would have their chances to cut into the lead, but they were held off the scoreboard. At half, Brown would lead the contest by a score of 6 to 2. 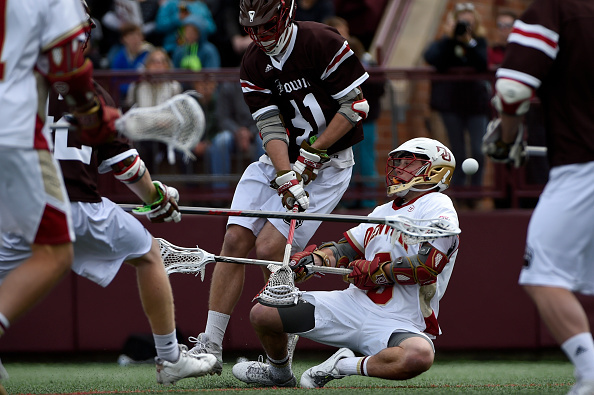 The second half scoring would start seven seconds in, as faceoff midfielder Will Gural would go directly to the goal as none of the defensive players slid to him. After an injury timeout, where Brown had to replace starting goaltender Jack Kelly, Hopkins would answer. Radziewicz would get his second of the game, beating junior Peter Scott. Again Brown would answer, just as they had to open the second half. Will Gural would win the faceoff unimpeded and beat Turnbaugh high. Brown would again have their five-goal advantage at 8-3 early in the third. Bailey Tills would find Kyle Bellistri open after a wild sequence of events in front of Turnbaugh. Prior to Hopkins being able to set their defense, the ball was in play, ending with the goal. Bellistri would get his second straight, pushing the lead to seven. Matt Graham would find Bellistri, garnering his second assist of the contest. Hopkins would get their third extra-man opportunity of the contest, attempting to cut into the lead after a Jack Kelly penalty. Again his replacement came into the contest, but this time was able to turn a one-on-one opportunity into a save and goal going the other way. On the turn of possession, Dylan Molloy was able to beat Turnbaugh, Caputo getting the assist. Henry Blynn would score with 3:39 to increase the lead to 12-3 in favor of the home team. Blynn would find a Turnbaugh save, roll into a checking defenseman, and shoot blindly at the goal, completing his hat trick. Hopkins troubles clearing the ball would continue, leading to extended possessions for the Brown offense. Brown would push the lead to double digits with just over two minutes left. Blynn would earn his fourth of the the game. On the following possession, Molloy would find Bellistri in close, getting the score to 14-3 in favor of Brown. When the defense was allowing shots with some distance, Turnbaugh was making every save. The goals Brown was getting were in close, difficult for any goalie to save. As the fourth quarter opened, Hopkins would get an extra-man goal when Shack Stanwick found Holden Cattoni for his second of the game. After the ensuing faceoff, Hopkins would be penalized for one minute. After a Turnbaugh save, he found Tal Bruno in the attack zone. Bruno would outrun his defenseman and find longstick midfielder Patrick Roley. With 13:45, Brown would lead 14-5. Brown answered with a Molloy tally to again push the lead to 10. In transition, Brown would get their 16th of the game when Larken Kemp went end-to-end with the ball. Hunter Moreland would win the faceoff and push transition, earning a penalty in the process, finding junior Wilkins Dismuke for the goal. Molloy would make it 17-6 with 3:54 remaining, scoring his 60th goal of the season. Hopkins senior Kelton Black would answer 20 seconds later, scoring a goal in his final game as a Blue Jay. On the following extra-man opportunity, Stanwick would find sophomore Pat Fraser to allow the Jays to get to eight. Dylan Molloy led all scorers on the day with four goals, four assists for eight points. Jack Kelly gets the win with 11 saves to his credit. Brock Turnbaugh played all 60 minutes, making 12 saves. Holden Cattoni was the only multi-goal scorer for the Blue Jays. Brown will move on to face the winner between Navy and Yale, which will be played tomorrow on the networks of ESPN.